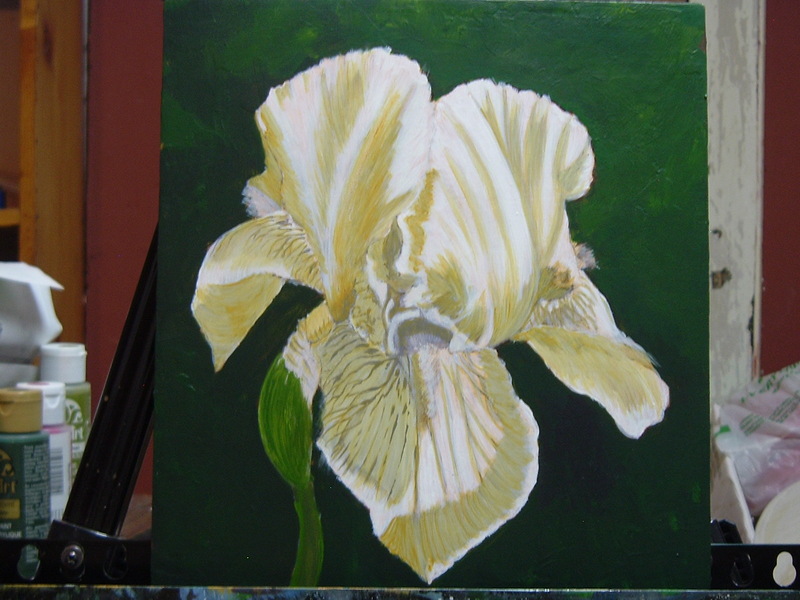 Here is another painting I have been working on this week. 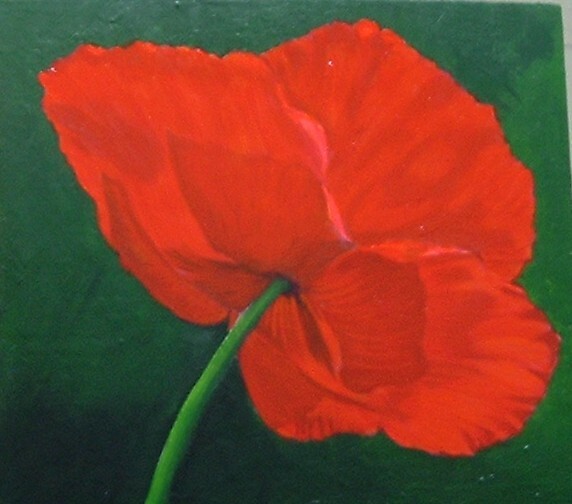 This is 8.5×9.5 inch masonite panel. 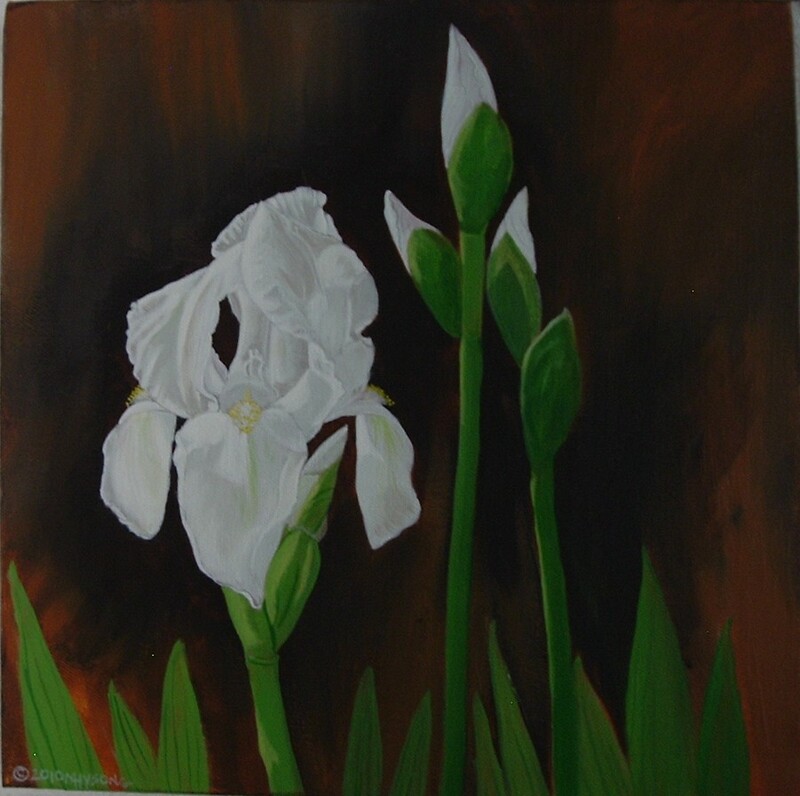 I am using Chroma’s Interactive acrylics. This is an acrylic paint that while it dries as fast as normal acrylics, I can rewet it and blend it even after it is touch dry. 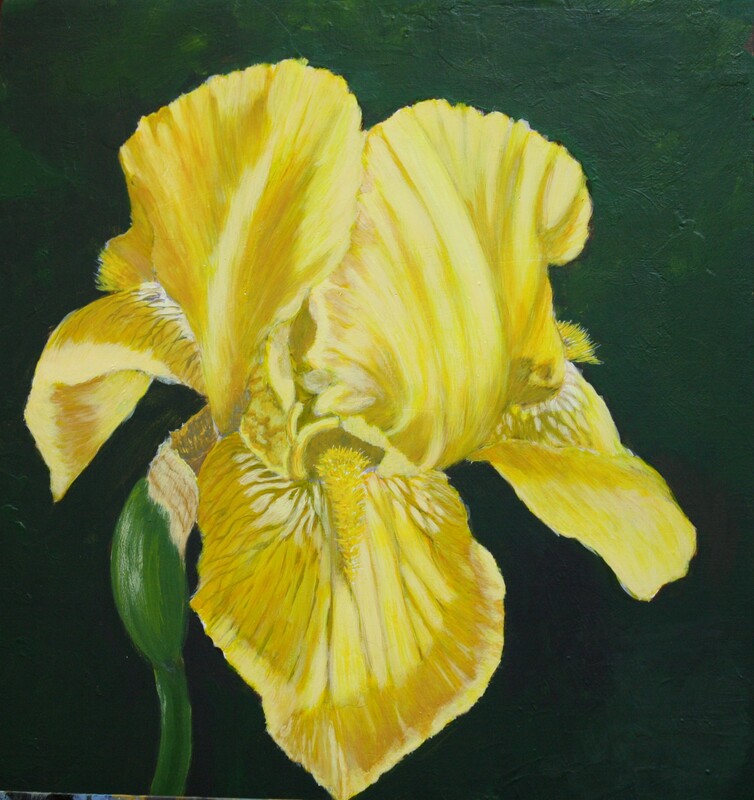 This means I can do some things similar to an oil painter. 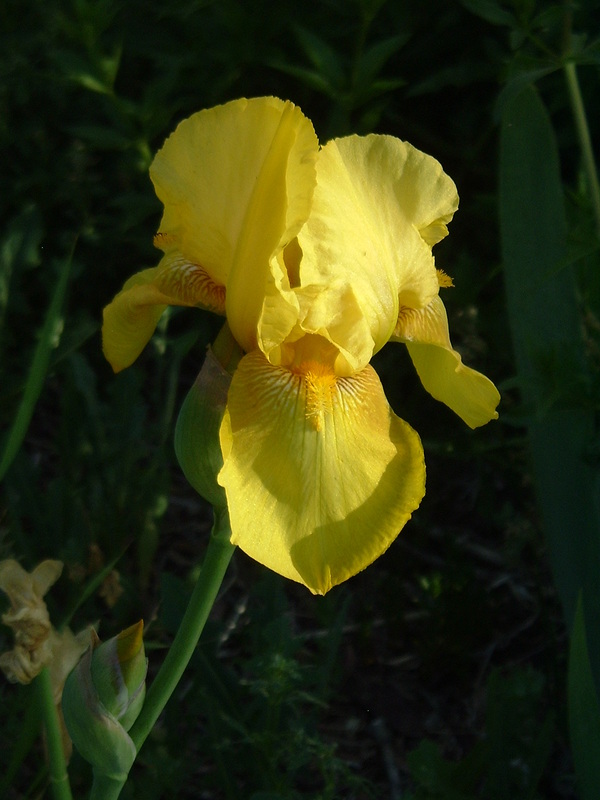 From a yellow Iris that grows in my garden. 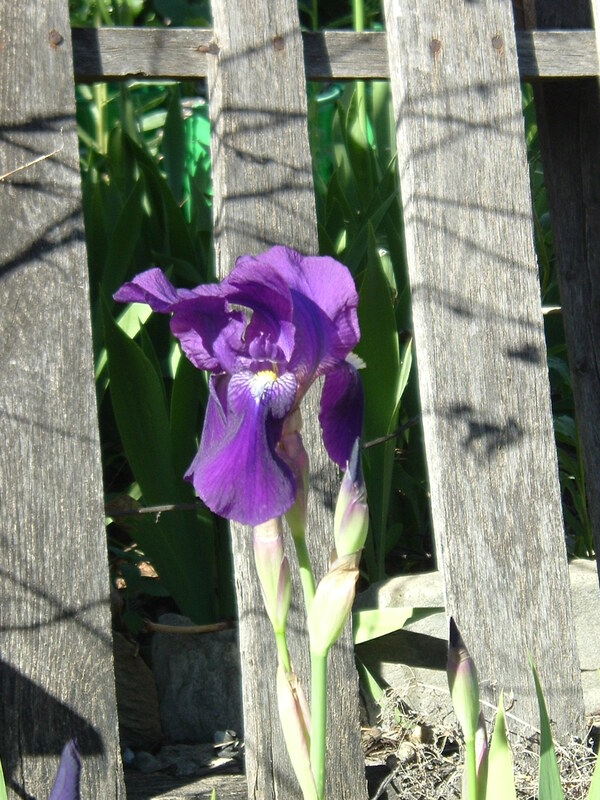 The reference photo; my granny grew these iris at her house on Gorden street and I brought some of them here. 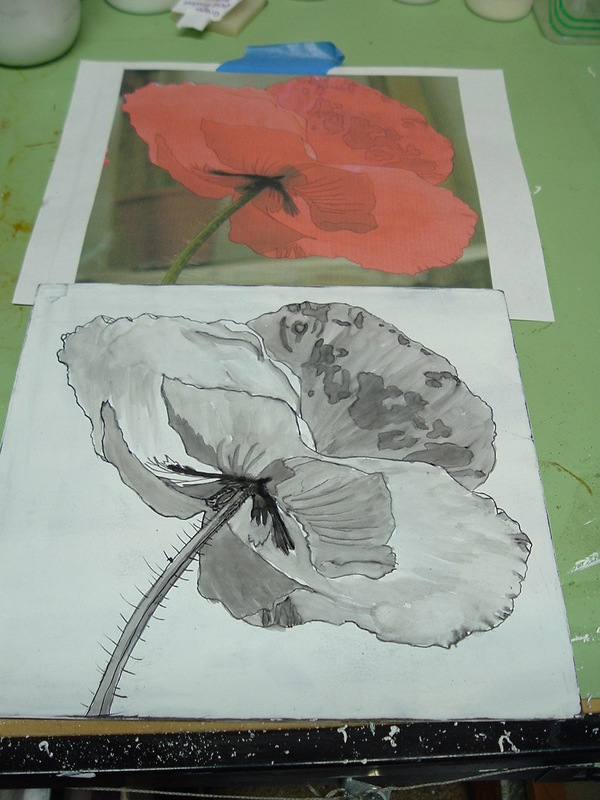 then I begin the grey layers. The grey layers help me get the colors right later. Here I have just gone over the shadows with yellow ochre, see how the underpainting changes the colors of the layer on top giving a range of shades darker and lighter. This is not a physical mixing. 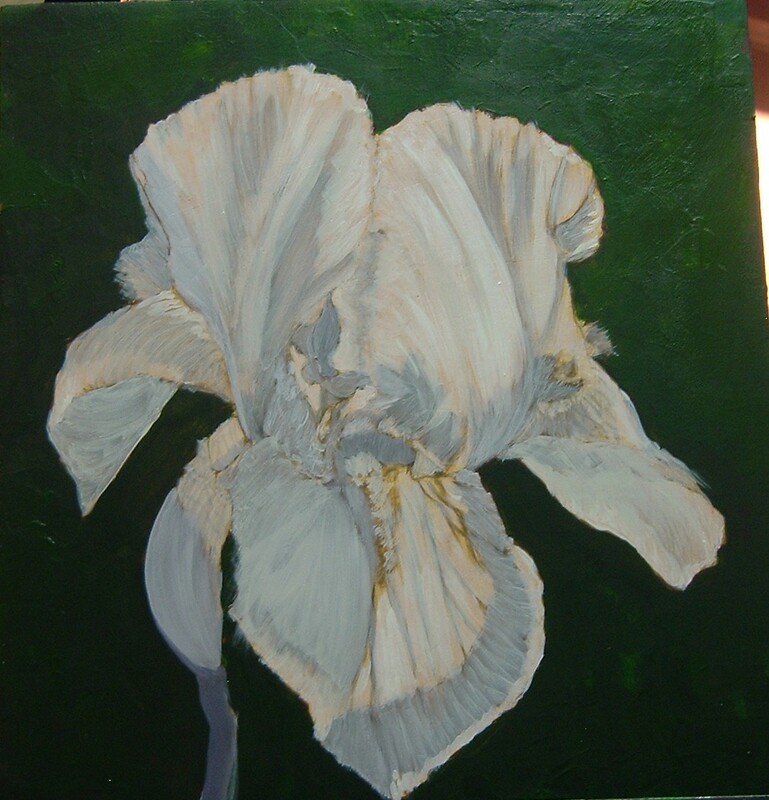 Since this is an acrylic that can be rewet and worked longer I seal the under painting with a clear coat so there is no physical mixing with the color layers; just optical mixing. 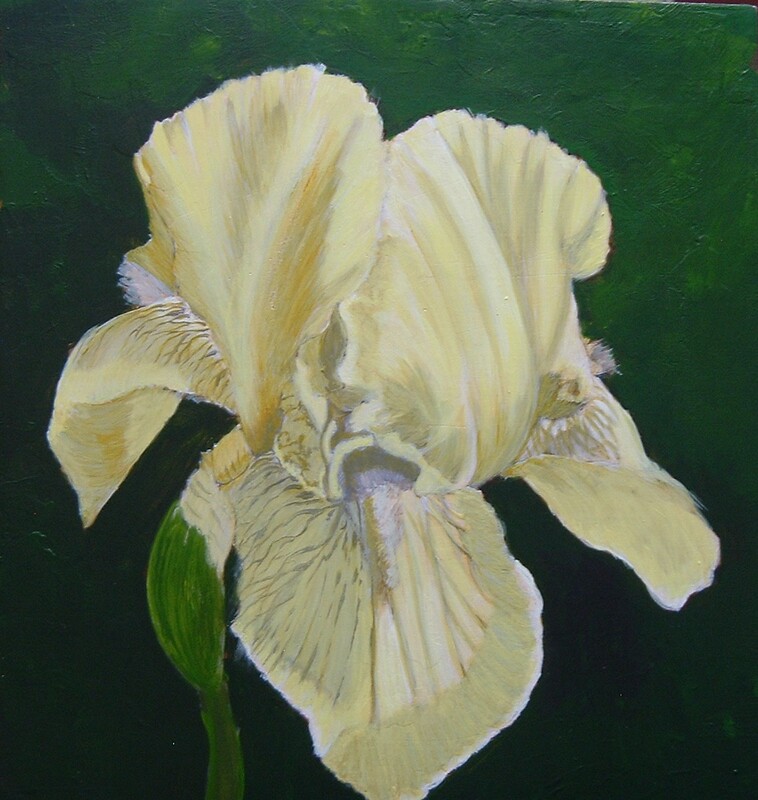 Now I have added Naple’s Yellow to most of the lighter areas. 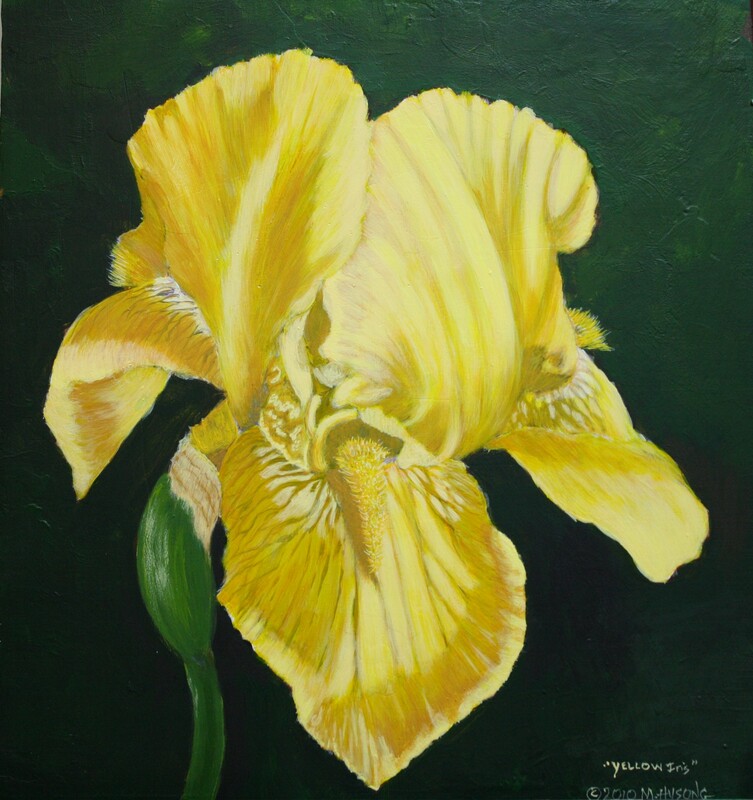 I have now done several more color layers, working back and forth with yellow ochre, Naple’s yellow, and Indian yellow, glazing each one in thin layers. 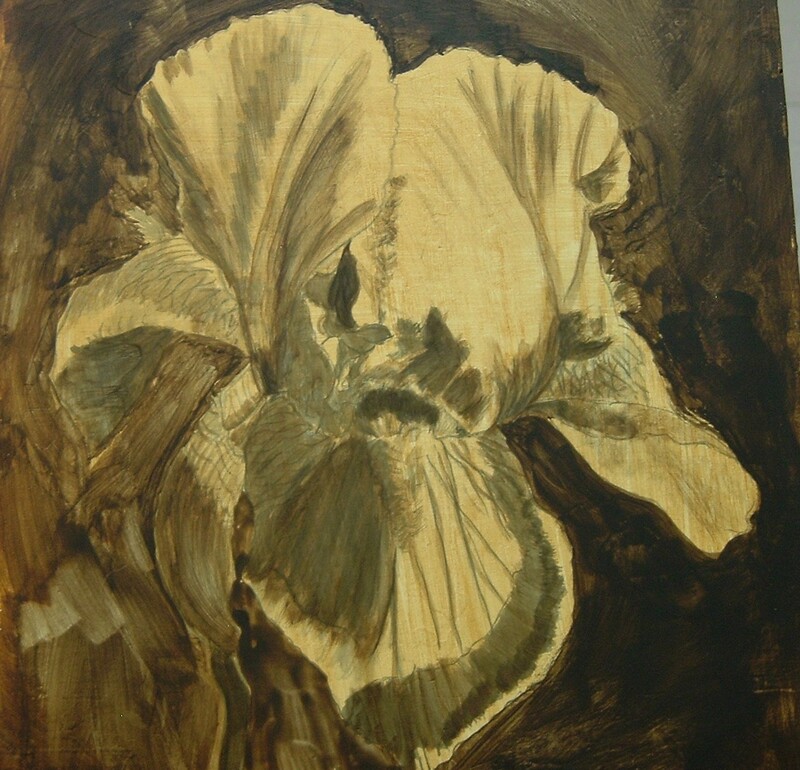 Note how much the underpainting still affects the color layers. I’ll be working on this a bit more today, adding some small highlights and such, but it’s about done. OK, this is probably not what you are thinking from the title, but I’m not changing it 😉 At the moment the garden is slipping a bit because I have been really concentrating on my next career: ART. So I thought you all might enjoy some of my paintings. 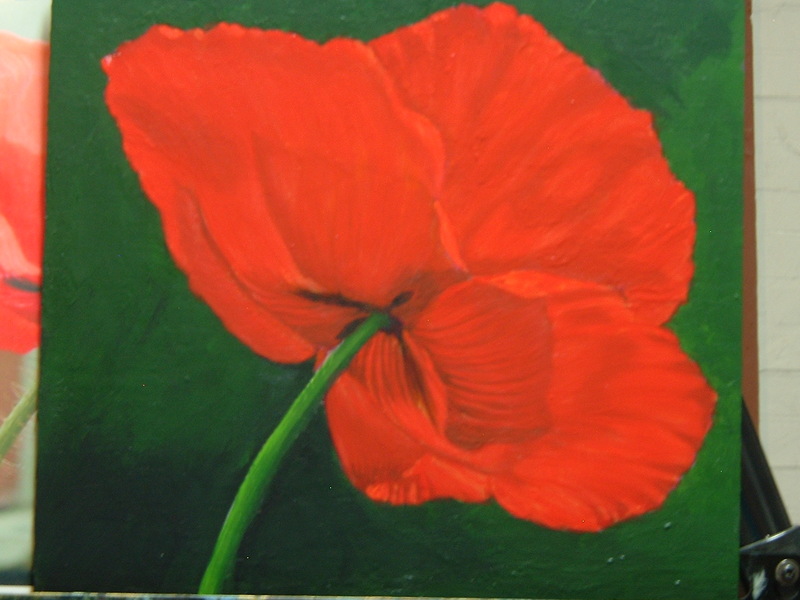 I’m going to start off with a red poppy that grew in my garden this spring…. This is acrylic on gessoed masonite, 8.5×9.5 inches. 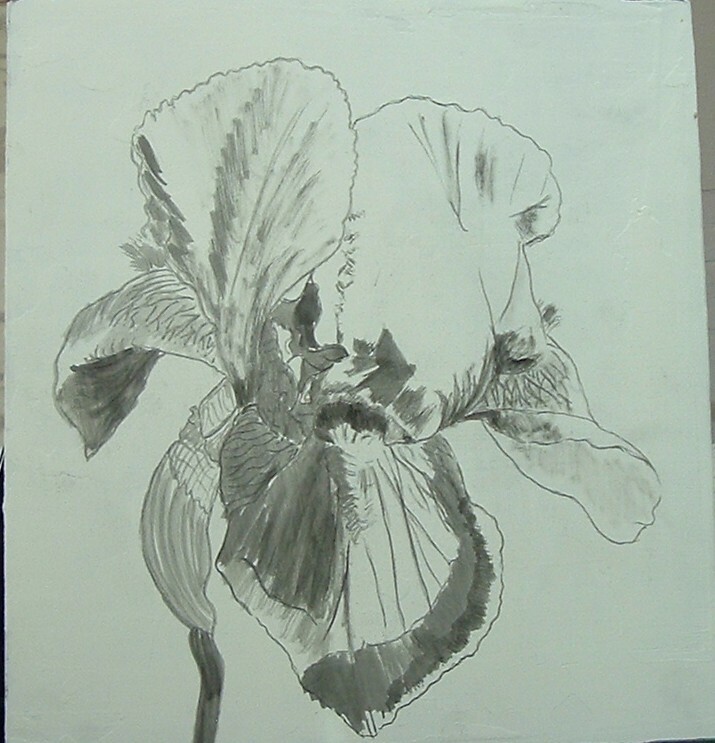 Here is the ink drawing with the reference photo. Yeah, the perspective is skewed because it is laying down on the table. several more layers and adjustments of the color Almost finished! Boy it’s been a long time since I posted here. The dog attacks last fall really took the wind out of my sails. But spring has come and the flowers are blooming. I haven’t done a lot in the garden, but here are some catch up pictures for you. 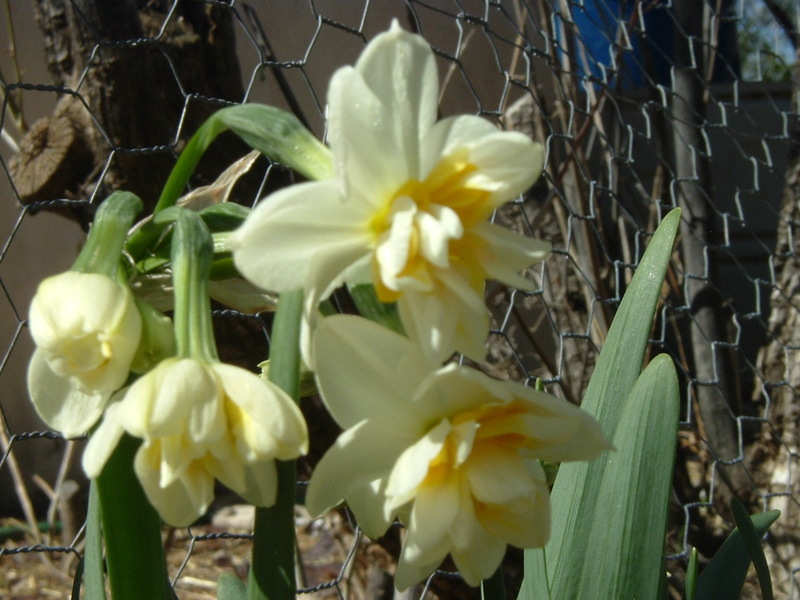 Spring comes early, like January and February, starting with the Paperwhites. 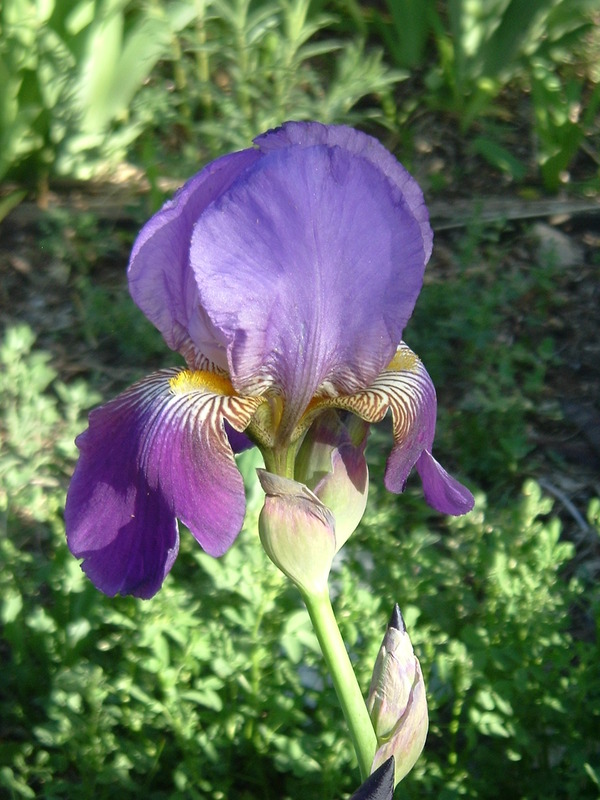 Then the short bearded iris come on. I have solid white and a purple kind. I think of these as being the old-fashioned ones because they were here when I moved in. I see them all over town. They do so well that when they get over crowded and I have to divide them I have even put them up on the side of the hill and along the creek bank. They are good to help control erosion. As long as they are not in a real hot spot they can get along without extra water, though they will bloom more prolifically if they have some. 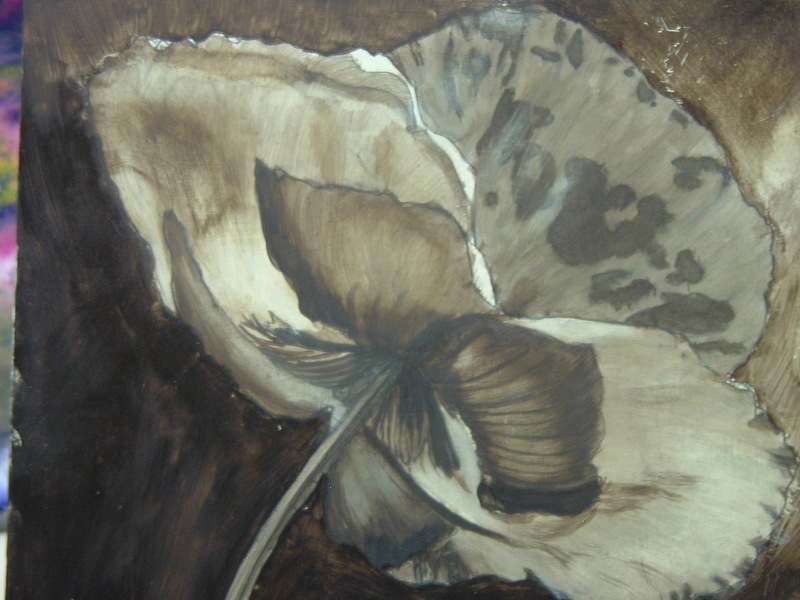 A painting I did from the above photo. 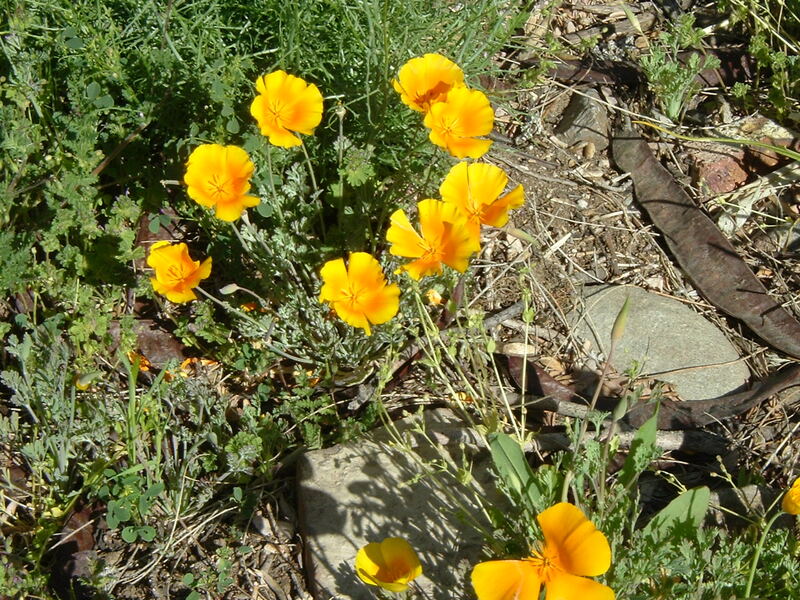 Some California poppies. These bloom all along the highways and on the hills around here. 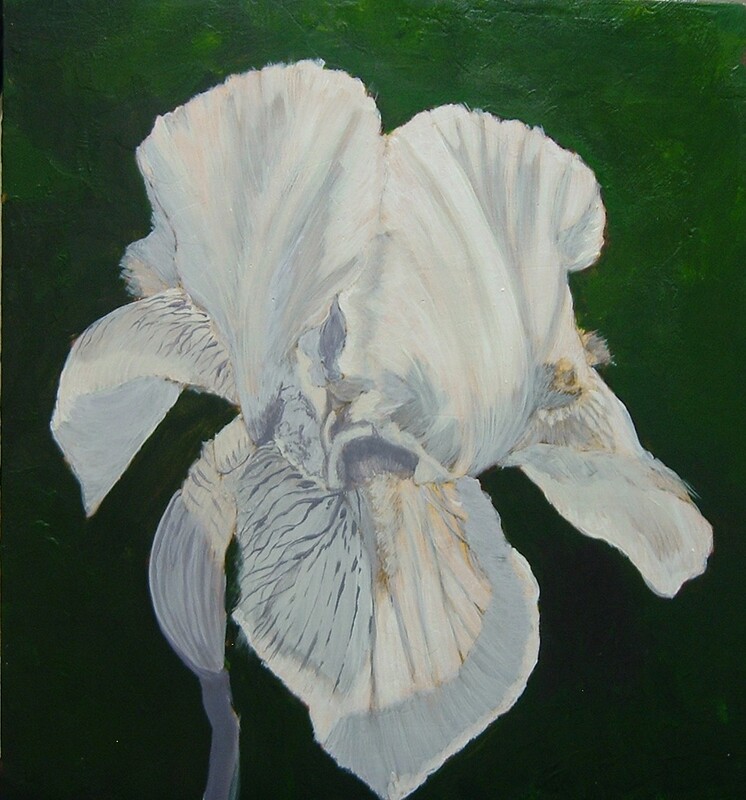 Later come the tall bearded iris. I don’t know the name of this variety either. This one grows about 3 1/2 feet tall with as many as 6 blooms to a stalk. About the same time these tall yellow ones come along, tho they are not quite as tall as the ones above. 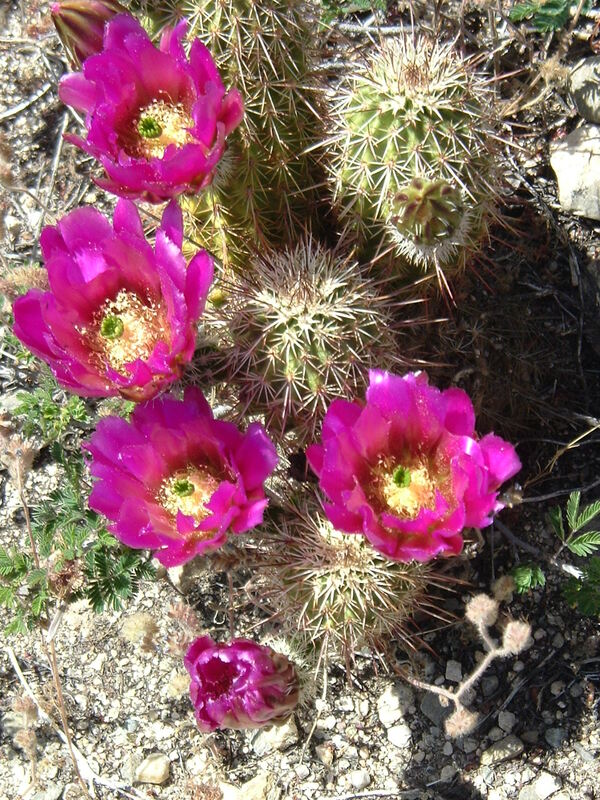 Over on the hillsides the cactus are blooming; this one is called a hedgehog. The photo does not really give you the true color; it is much more intense, nearly fluorescent. 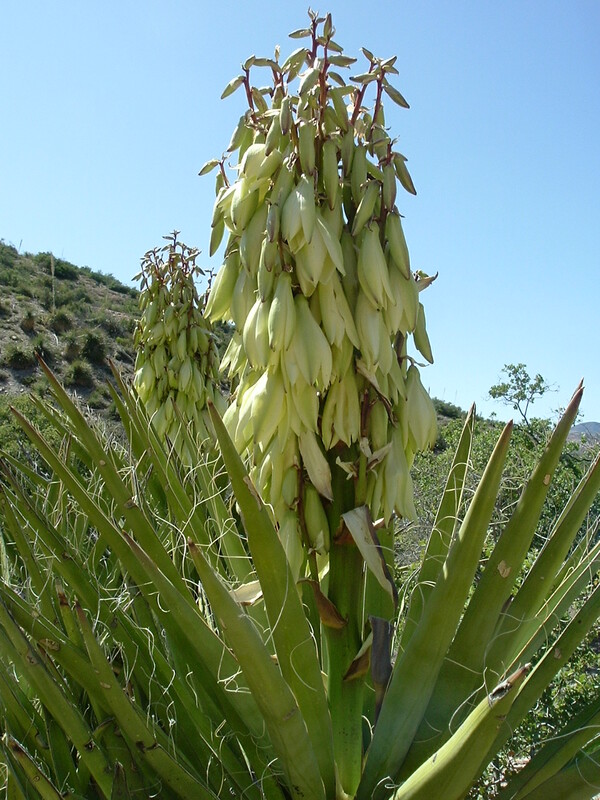 Here is a yucca blooming. 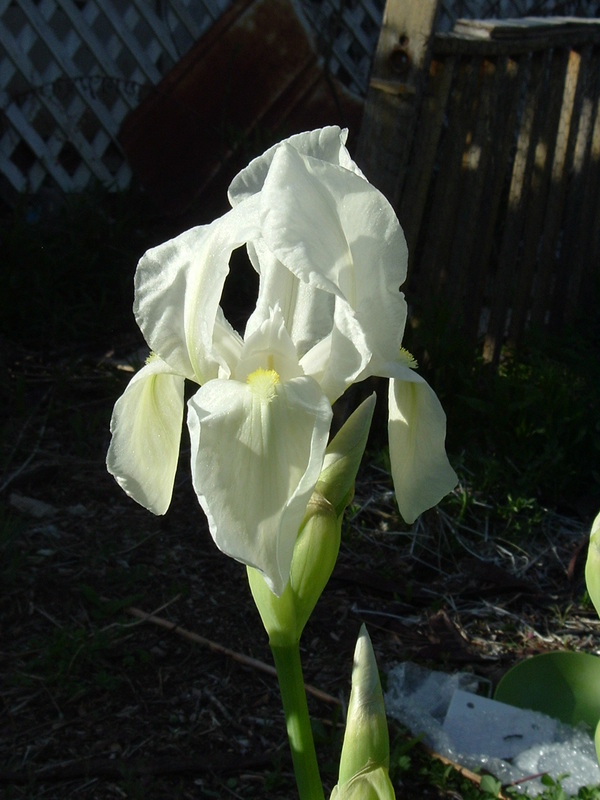 They are related to our garden lilies. The Native Americans used this plant for making baskets and shoes. The would strip the fibers off the leaves and the sharp points provided a ready-made needle. Also, they would watch the plants in early spring and when the bloom stalk started to swell up out of the plant they would cut the plant down and roast the middle of it in the embers of their fire. 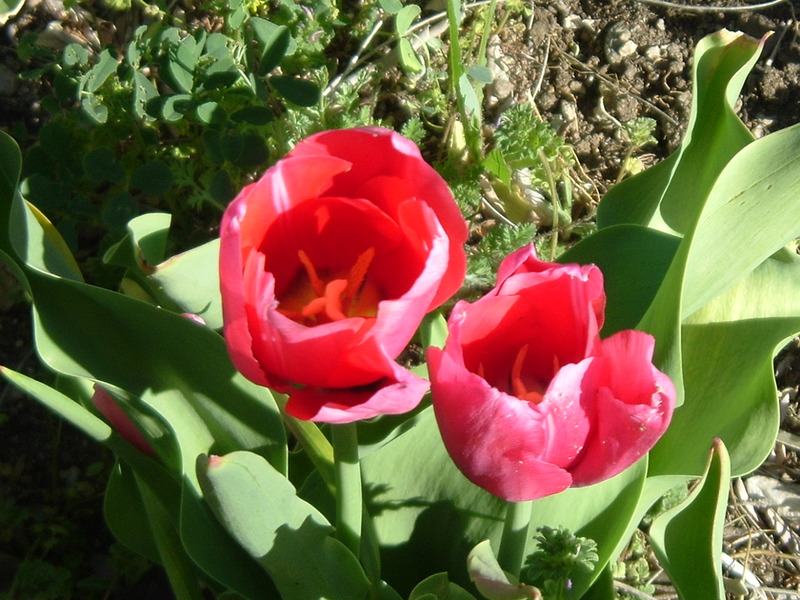 The plant stores up a lot of carbohydrate in preparation for blooming and setting seeds. When roasted those carbs turn to sugars and made a sweet treat. Well that’s all for now. I’ll try to post some more later today or tomorrow.